I’m an obsessive Holiday Cookie maker. It’s the one time of the year that I throw all caution (and calorie counting) to the wind and make every kind of cookie or treat my family desires. In fact, on December 1st, we sat down and had a family baking and strategy session (you’ll understand why I said strategy here in a second) and came up with 11 different kinds of cookies we wanted to make this year. 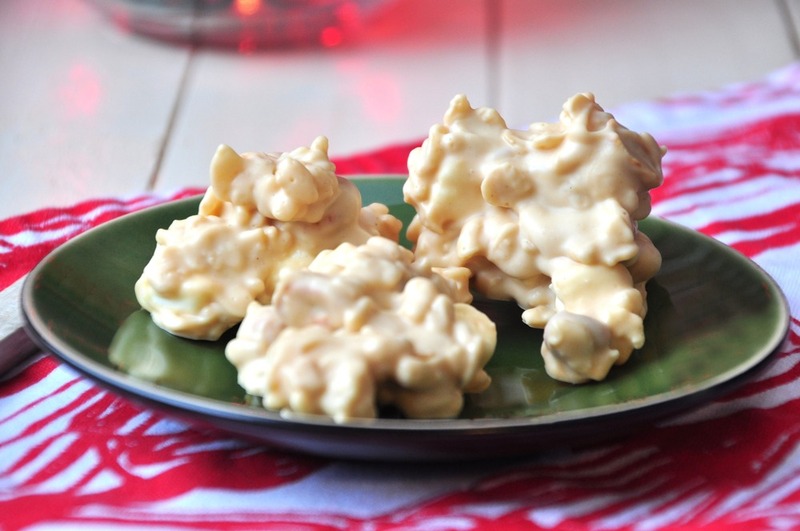 At the top of everyone’s the list, White Chocolate Peanut Butter Krispy No-Bake Cookies. But Vinny, is his/her wisdom, put white chocolate, Planters Creamy Peanut Butter, dry-roasted peanuts, puffed rice cereal, and marshmallows together. And by some act of amazingness, maybe a chemical reaction that happens when all of these ingredients meet, they create little bits of awesomeness that are highly addictive. These are very kid-friendly to make because you only have to warm up the white chocolate in the microwave and everything else is dump, mix, and drop. And you might want to double up on this recipe if you’ve never had it before, because the first batch may be gone 24 hours after making. #justsayin Good thing there are up to $20 in Kraft Printable Coupons available on Target.com. Just a way for Kraft to give you a little help for the holidays while making Christmas Cookies or your Christmas Dinner. 1. Place almond bark in a large glass bowl (8 cups or larger) and cook in microwave in one minute increments until melted. 2. Stir in Planters Peanut Butter, peanuts, marshmallows and cereal, until well blended. Feel free to change up this recipe as needed. I’ve done mixtures almond bark, cranberries, and dry roasted peanuts. Interested in more recipes? Check out Kelly’s Kitchen Recipe Index. Is puffed rice cereal like rice krispies or something different? Instead of white almond bark, could I use white chocolate chips? If so…how much?? How many does the batch make? You say 1 pack of almond bark- how many OZ? My grocery store carries multiples pack sizes!